The ACDA is a 501(c)(3) non-profit, tax-exempt organization as designated by the Internal Revenue Code of the United States. The ACDA was founded in 1996 by Madonna and Jeff Myers after the death of their daughter from ACDMPV. Worldwide, there are only a few hundred cases of ACDMPV reported formally in the medical literature since first identified in 1948. The incidence or prevalence of ACDMPV is not yet known but there are almost certainly more cases than those officially reported. Mrs. Meyers initially formed the ACDA by contacting doctors and researchers with articles published on ACDMPV and asked those doctors and researchers to refer families to her case by case. The Myers transitioned leadership of the ACDA to Steve and Donna Hanson in 2002, whose son died of ACDMPV in 1997. After many years of dedicated service, the Hansons officially stepped down in February 2017 after transitioning leadership duties of the ACDA to Eliza and John Rista in August 2015. During this time, the ACDA has grown to over 200 registered families from around the world. In 2003, the National Organization of Rare Disorders (NORD) added ACDMPV to the Rare Disease Database, which is a compendium of 1,200+ rare disease reports developed for patients and their families in connection with the almost 7,000 rare diseases classified under NORD’s umbrella. In 2011, a private Facebook support group (ACD Parent Group) was separately created by ACDA parent Emily Eschweiler for parents with a child affected by ACDMPV. The ACDA obtained non-profit 501(c)3 status in 2014. ACDMPV is a rare disease and conclusive evidence about the cause of ACDMPV does not presently exist. 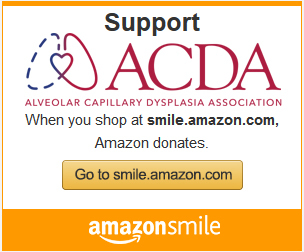 The ACDA is dedicated to increasing ACDMPV awareness and funding ACDMPV research in the medical community while simultaneously providing a supportive environment for families affected by ACDMPV. The ultimate goal of the ACDA is to support the efforts of the medical community to find the cause of and cure for ACDMPV.